The Thomas Fredrick Duck crew families and friends at the dedication service, MoTaT Aviation Hall, 2 February 2016 (NZ Bomber Command Association). A wonderful gathering took place at Auckland’s Museum of Transport & Technology (MoTaT) on the 2nd of February, a meeting born out of friendships first made over 70 years ago. A special dedication service was held for the “Thomas Fredrick Duck” display, put together by MoTaT and the NZ Bomber Command Association, and recently opened in MoTaT’s Aviation Hall. The display commemorates the crew of the famous 156 Path Finder Squadron Lancaster, JA909, GT-T, Thomas Fredrick Duck, as featured in Alan Mitchell’s book, “New Zealanders in the Air War”. There is a very strong 75 (NZ) Squadron connection. All six New Zealanders in Jack Wright’s crew at 156 PFF Squadron had crewed together or got to know each other on their previous tour of op’s with 75, along with a seventh individual, Jack’s original Rear Gunner, Bruce Neal. Members of the families of five of the TFD crew were represented at the service, plus the family of Bruce Neal, who would also have been part of the legend if tragedy had not intervened. At 75 (NZ) Squadron, Feltwell, Pilot Jack Wright, Navigator Charles Kelly, W/Op Nick Carter and gunners Podge Reynolds and Bruce Neal, had flown Wellington BJ772, AA-D “Donald”, which proudly carried nose art depicting an aviator-attired Donald Duck sitting in a half-shell. Navigator Alf Drew had flown with Neville Hockaday’s crew in BJ837, AA-F “Freddie”. “Donald” and “Freddie” were in adjacent dispersals, so the two crews had got to know each other well. At the same time, Rear Gunner Ken Crankshaw had been flying as a “spare part” gunner with a variety of crews, including Squadron Leaders Frank Denton, Ray Newton, and Artie Ashworth. He ended up his tour flying with Frankie Curr and his crew. 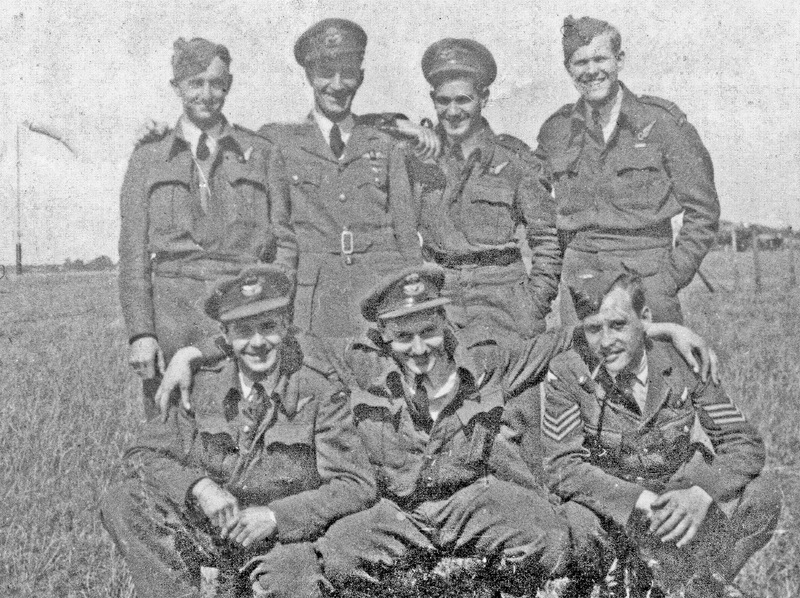 After completing their tour, most of the “Donald” crew were posted to 30 OTU as instructors for six months, before being posted to 156 Path Finders Squadron at Warboys. Tragically, Bruce was killed while instructing at a Bombing & Gunnery School, and never got the chance to re-join his mates at 156 PFF Sqdn. Path Finder Lancaster crews needed two Navigators, so their mate Alf Drew was recruited to join them. Crankshaw was already at 156 when they arrived, so he joined the crew as Rear Gunner, along with an English Flight Engineer, Harry Hammond. Legend has it that the boys had brought the original Donald Duck nose art with them, on a piece of Wellington canvas, but in fact their old “Donald” had been burnt out when a Boston bomber crash landed at Mildenhall, just before they were posted out. Apparently copies of the nose art were made at 156, and after the “Donald” and “Freddy” veterans had been allocated Lancaster GT-T for “Tommy”, “Duck” was applied to their new aircraft, along with the compromise name, “Thomas Fredrick Duck”. After the TFD crew had safely completed their tour at 156, the nose art was removed from their Lancaster and kept by Nick Carter, and a second copy was kept by Jack Wright. Many years after the war, the original art was donated by Nick to the Air Force Museum at Wigram, and the second copy was donated by the Wright family to MoTaT. The latter has become the centre piece of the new display. Thomas Fredrick Duck copy artwork produced on canvas at 156 PFF Sqdn, 1943, signed on the back by a member of TFD’s ground crew, LAC Maund (NZ Bomber Command Assn). A representative of each Thomas Fredrick Duck crew member family, in front of the display – L-R: Alf Drew’s son, RNZAF Chaplain S/L Stuart Hight, Charles Kelly’s son Steve, Jack Wright’s daughter Lesley, Ron Mayhill (NZBCA President), Nick Carter’s widow, Ken Crankshaw’s grandson Clayton (NZ Bomber Command Assn). There was an impressive turn-out of around 50 people. Sadly, none of the crew survives, the last, Nick Carter, passing away last year. However it was very special that his widow was able to attend. RNZAF Chaplain S/L Stuart Hight led the service, and NZBCA President Ron Mayhill DFC, Legion of Honour, Peter Wheeler and Chris Newey each spoke about aspects of the crew and the significance of the display in helping us to remember the contributions of the airmen of Bomber Command. It was an uplifting and at times very emotional occasion to have all six families together, 70 years later, to pay our respects to these brave men, for individuals to be able to speak to the gathering, read items from diaries, logbooks and memoirs, recount favourite anecdotes, and then meet and chat afterwards. The respect and affection felt towards their skipper and crewmates was a strong common theme in the stories that have been handed down, and it must have been deeply satisfying for descendants to hear these shared again after so many years. One very exciting thing that emerged from the gathering was the realisation that the families collectively hold a large amount of previously unknown material, so the full story of the Thomas Fredrick Duck boys is yet to be told. It was just a shame that no-one from the family of Raymond “Podge” Reynolds could be located in time for the occasion. Raymond passed away in 1991 and is buried at Otaki – the NZBCA would very much like to hear from anyone who can help put them in contact with relatives. – Thanks to Peter Wheeler and the NZ Bomber Command Assn for these photos. This entry was posted in general and tagged 'A' Flight Commander 75(NZ) Squadron, 156 PFF Squadron RAF, 1942, 1944, 1945, 75(NZ) Squadron RAF, Benjamin Allan Franklin, Bruce Neal, C. Williams, Charles Wynne Brunsdon Kelly, Feltwell, George William Rhodes, Gerald Howard Jacobson, J.E. Ford, John Henry Morgan, Maurice Allington Carter, Maurice Edward Parker, Mepal, Percival McDowell Johnstone, Raymond Clifford Reynolds, ric Thomas Coulson, Robert John Torbitt, Roderick Adrian Powell, Roy deWilmot Tully, Roy William Raharuhi, S/L Jack Wright, Squadron Leader John Leonard Wright DSO DFC, T.R. Kemp, Victor Kenneth Westerman, Wallace Bassett Martin, William Lachlan Wilson on February 24, 2016 by 75nzsquadron. Squadron Leader John ‘Jack’ Leonard Wright, DSO, DFC. I really must apologise for the very belated posting of this chapter from ‘New Zealanders in the Air War’ by Alan W. Mitchell. The contents of the chapter was actually bought to my attention by Jack’s daughter, Leslie and her sister. On a wintry night in October 1943 the staff in the control-room of a Bomber Station watched solemnly as the word ‘ missing ’ was chalked on a large blackboard opposite the ﬂight record of T Tommy, which was then nearly two hours overdue, and from which no signals had been received for several hours. All the other aircraft in that particular Lancaster squadron had been accounted for, but hope for this remaining one had been abandoned. The main lights in the control-room were switched-off, and tired men and women left for a well-eamed rest. More than one went rather glumly, knowing that the crew of T Tommy was on the ﬁnal operation of its second tour. It was indeed wretched luck that it should now be posted missing. Actually, however, although T Tommy was posted as missing on the blackboard, it was still airborne and each of its crew of seven was ﬁrmly determined they would make base again that night. There were six New Zealanders and one Cockney in T Tommy, which bore as its mascot a painting on the fuselage of an irate Donald Duck with the caption “ Thomas Frederick Duck.” All the New Zealanders were on their sixtieth operation, and the Londoner was on his thirtieth; and, while the chalk was yet scratching the fateful word on the board, two of the four engines of the Lancaster were still rumbling several thousand feet above the English Channel. It had been an unpleasant ﬂight. They had been to Leipzig. On the way out, over the Channel, one of the Lancaster’s four motors had spluttered, but the captain had ﬂown on without hesitation. It was the starboard inner motor, and after helping to lift the aircraft over a high, cold front, it ﬁnally cut-out when Hanover lay below. The aircraft began to lose height, the needle on the oil temperature gauge ﬂickered towards the higher ﬁgures, the altitude ‘ blower ’ stopped working, and the two outer motors also beat unevenly. Yet the Lancaster maintained course. Instead of ﬂying at 20,000 feet it was now at 11,000 feet, which made it a much easier mark for the German defences; but eventually the target was reached, and the bomb-aimer automatically called his directions to the captain and pressed the bomb switch. The bombs, however, remained in their racks, and stuck there until one of the navigators and the wireless operator removed a part of the ﬂooring and hacked at the bomb releases with an axe and set them free. Its mission accomplished, the Lancaster then headed for England. The captain consulted his navigators, for he knew that the aircraft could not climb above the cold front, which reached to 23,000 feet, on three motors. There were three alternatives open: one, to ﬂy below the front and risk the deadly ﬂak and ﬁghters; the second, to ﬂy at almost tree-top height and still risk the defences; the third, to veer southwards and ﬂy on a semicircular course to England. The navigators advised the third alternative. They were conﬁdent they could keep a good course, and every one in T Tommy agreed that it was the safest method. When the crew stumped into the control-room nearly two and a half hours overdue they smiled at the chalked word ‘ Missing ’ still standing against T Tommy, and agreed it was an excellent joke. They were weary but elated at the normal ending to an abnormal ﬂight. The crew of ‘Thomas Frederick Duck’ at 156 PFF Squadron May – November 1943. Read the rest of this chapter in the ‘Collections’ section of the blog here. This entry was posted in general and tagged 'A' Flight Commander 75(NZ) Squadron, 156 PFF Squadron RAF, 1942, 1944, 1945, 75(NZ) Squadron RAF, Benjamin Allan Franklin, BJ772 T-Thomas Frederick Duck, Bruce Neal, C. Williams, Charles Wynne Brunsdon Kelly, D-Donald Duck, Eric Thomas Coulson, Feltwell, George William Rhodes, Gerald Howard Jacobson, J.E. Ford, John Henry Morgan, Maurice Allington Carter, Maurice Edward Parker, Mepal, Percival McDowell Johnstone, Raymond Clifford Reynolds, Robert John Torbitt, Roderick Adrian Powell, Roy deWilmot Tully, Roy William Raharuhi, S/L Jack Wright, Squadron Leader John Leonard Wright DSO DFC, T.R. Kemp, Victor Kenneth Westerman, Wallace Bassett Martin, William Lachlan Wilson on January 19, 2014 by 75nzsquadron. Some time ago, I was contacted by Leslie, daughter of S/L John Leonard Wright, who flew with 75(NZ) Squadron twice, as well with 156 Pathfinder Squadron. “During the past year I have been researching my father’s war service and have come up against a brick wall. Now that I’ve found your lively and interesting blog I’m sure some people will have information that will be of interest to me. My father, Squadron Leader John (Jack) Leonard Wright DSO, DFC did his first Tour on 75 Squadron from 29 May to 20 October 1942. He and his crew were later on 156 Pathfinder Squadron from 21 May 1943 to mid November 1943. After they finished on 156, things get a bit puzzling as the crew was disbanded. His record from Trentham, Wellington, NZ says he was seconded to Liaison duties at Uxbridge, No 31 Base from 1/11/44 (and the same date RAF Staff College – the same place, I presume). THEN he is back on 75 from 28 November 1944 as ‘A’ Flight Commander, until around the end of March. I realise that out of respect for my father, people may be reluctant to say much about my father’s condition, but I really want to know about it, and would appreciate anyone with information being open and frank with me. I do have the names of some of the people who crewed with him during this second tour on 75, but they may prefer to get in touch with me privately – through Simon. 2. Later, he is with PWX Liaison Sectn, SCHAEF Rear from 5 April 1945 – I’d like to know what this was, and what were they doing? I know that my father was in Germany for some months – were they repatriating British POW’s? or what???? I do hope you may be able to point me in the right direction with some of this, or even provide me with some information. I look forward to hearing from you. F/Sgt Victor Kenneth Westerman RNZAF NZ41970 as 2nd Pilot – Died Wednesday 29th July 1942, age 24, during a raid on Hamburg. Buried Becklingen War Cemetery Germany. Bruce Neal returns as Rear Gunner. F/L Gerald Howard Jacobson RNZAF NZ41333 as 2nd Pilot – Died Thursday 17 December 1942, age 27, during a raid on Fallersleben. Buried Rheinberg War Cemetery, Germany. Sgt Benjamin Allan Franklin RNZAF NZ414277 as 2nd Pilot – Died Wednesday 16th December 1942, age 21, when his aircraft crashed on take-off for a mine-laying sortie to the Gironde Estuary – the mine load exploding. Buried Newmarket Cemetery, England. Sgt George William Rhodes RAFVR 1331658 as 2nd Pilot – Died Tuesday 6th October 1942, age 20, during a raid on Osnabruck. Buried Hardenberg Protestant Cemetery Netherlands. I suspect Jack and his crew at 156 PFF Squadron May – November 1943. By the 21st May 1943 John and it would appear Charles Kelly, Maurice ‘Nick’ Carter and Ray ‘Podge’ Reynolds have joined 156 Squadron PFF. He will stay with the Squadron until mid November of that year. 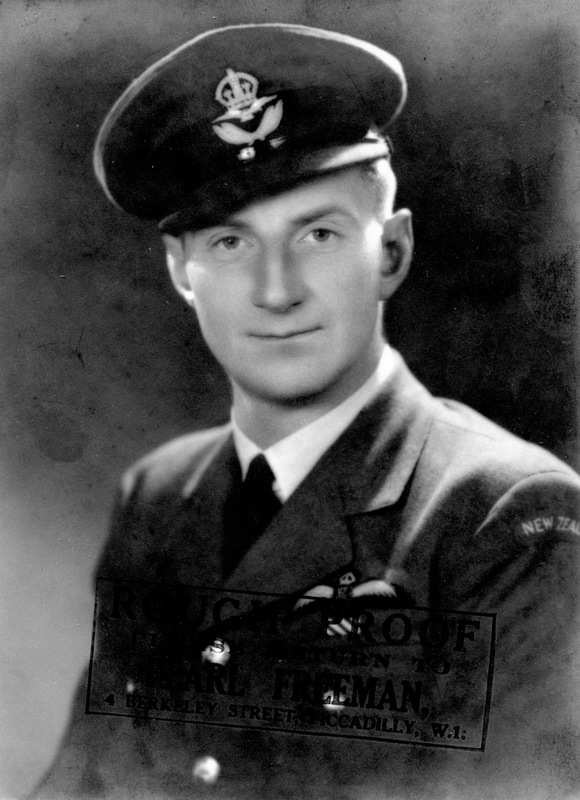 John returns to 75(NZ) Squadron RAF at the end of November 1944 as ‘A’ Flight Commander. F/O Wallace Bassett Martin as 2nd Pilot. W/O Roderick Adrian Powell replaces Roy Tully as Rear Gunner. W/O Robert John Torbitt replaces Adrian Powell as Rear Gunner. Roy Tully returns as Rear Gunner. Bob Torbitt replaces Roy Tully as Rear Gunner. This brings Jacks Op’s with 75(NZ) Squadron RAF to a total of 47 – with a tour with 156 PFF to be added to this figure. I hope that someone is able to help Leslie regarding in formation on her Father. If you have information about Jack, but would prefer not to publicly post it then please contact me directly at info@75nzsquadron.com and I will pass it on to Leslie. Additionally, if you come across this post based on a search for 156 PFF Squadron and you are able to help, we would love to have Jack’s Op history and possibly crew from that Squadron. This entry was posted in general and tagged 'A' Flight Commander 75(NZ) Squadron, 156 PFF Squadron RAF, 1942, 1944, 1945, 75(NZ) Squadron RAF, Benjamin Allan Franklin, Bruce Neal, C. Williams, Charles Wynne Brunsdon Kelly, Feltwell, George William Rhodes, Gerald Howard Jacobson, J.E. Ford, John Henry Morgan, Maurice Allington Carter, Maurice Edward Parker, Mepal, Percival McDowell Johnstone, Raymond Clifford Reynolds, ric Thomas Coulson, Robert John Torbitt, Roderick Adrian Powell, Roy deWilmot Tully, Roy William Raharuhi, S/L Jack Wright, Squadron Leader John Leonard Wright DSO DFC, T.R. Kemp, Victor Kenneth Westerman, Wallace Bassett Martin, William Lachlan Wilson on August 4, 2013 by 75nzsquadron.